It's taken a while, but I finally get to review ITG's Ultimate Memorabilia 11! I would like to first thank Youtube user tvtvrain (Miles) for helping me get the cards necessary for this review. Without him, this review either would not have happened or would have been even more delayed. Please go to his Youtube channel and check him out. Amazing, amazing stuff there... and he's a big ITG fan. Now, let's see what nastiness ITG brings to the table with their uber high-end release. Each standard pack of UM11 comes with three cards - the first of which is the base card. 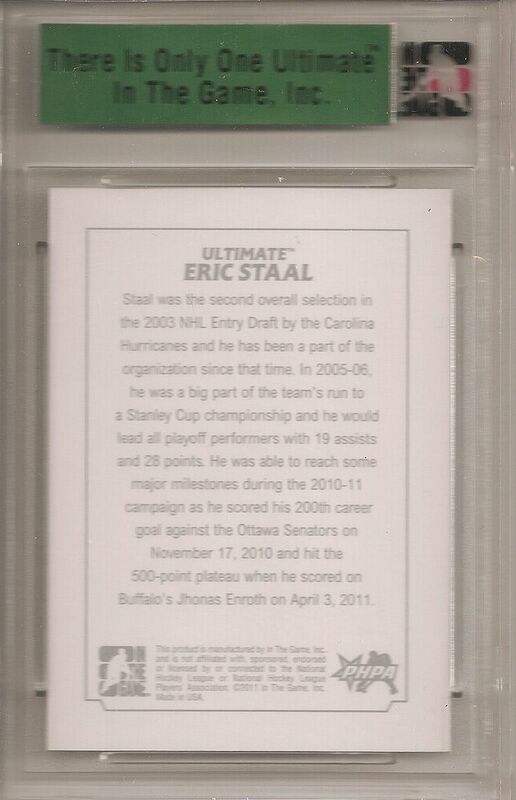 Even though there is no memorabilia or autograph on these cards, they are encased in ITG's special card holder. Like all ITG encapsulated cards, the inset at the top gives information about what the card you have is: the product name/year, type, player, number of copies, and number in the production run. For UM11, ITG chose to go with a very basic base card design. The card is only two color tones - white and silver. The artwork looks great, but to me the card is quite bland. The silver ink is too close to the white background and gives the cards a very washed out feel. It just doesn't stand out. I would have preferred a bolder approach - perhaps a different choice than silver or to just have the player image in full color. As it stands, what sticks out to me most is the foil green label above the card. The back of the base cards are nice. I definitely like the thin silver border over the thick one on the front - it's pretty classy. Now I don't mind the back's use of silver ink like I did on the front. It's very clean and regal, and works great with the paragraph. I enjoy that the card features a lengthy paragraph of information about the player. These cards do no contain any stat lines, but often these super high-end cards do not carry them, or even if they do, very minimally. All the standard silver versions of the base cards are limited to only 62. Yes, these cards are scarce! In packs you may find other versions of the base cards such as gold ones or even 1 of 1 original artwork versions of the base cards. Similar to other high-end releases, this is where the meat and potatoes of the product are. Aside from the base card, the other two cards within the pack are an autograph card and a memorabilia card. Some cards will feature an autograph along with a memorabilia piece. And every card will have an extremely low production run. Shown above is a standard autographed card you might find in UM11. 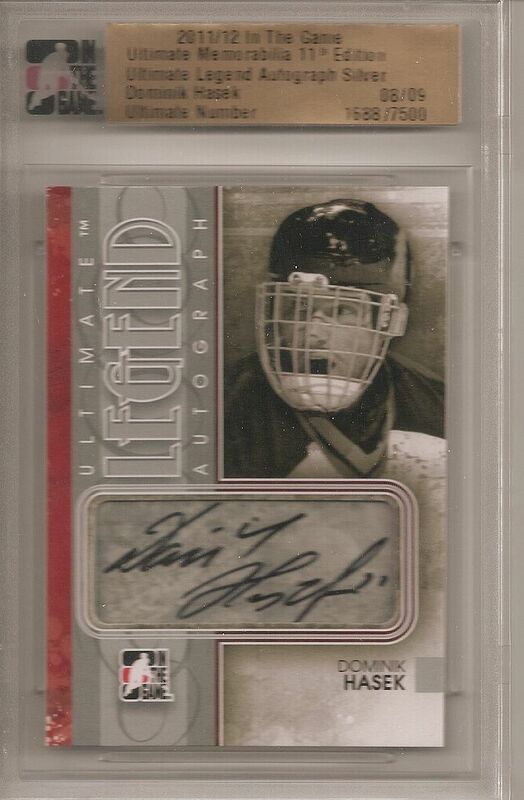 It's of goalie legend Dominik Hasek. This card is numbered 8 of 9. The design of this card is top notch. In the past I, along with other collectors, have had issues with how ITG designed their cards. Not here. This Ultimate Legend Autograph looks great from top to bottom. The color scheme is very modern. I love the shades of grey that ITG employs here. There is something very industrial about it. The single red border of the left hand side of the card is a great accent. The lines flow well and every piece of the card is perfect where it is, from the picture, to the framed autograph, to the logos. This card looks just as good as anything coming out of Upper Deck and Panini. Excellent job here ITG. This is the way modern cards look! 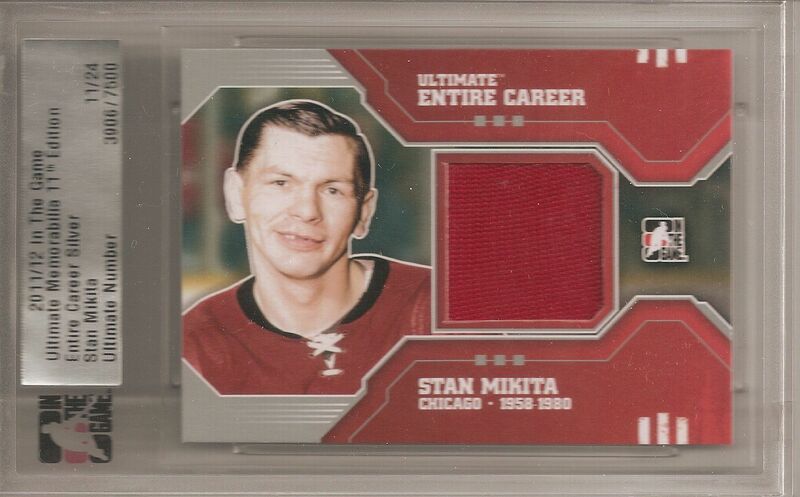 This Stan Mikita jersey card is typical of a jersey found in UM11. It's probably the most basic type you will find in the product. Even though it's just a single jersey swatch, it is still limited to only 24 copies, and contains a good-sized chunk of jersey. 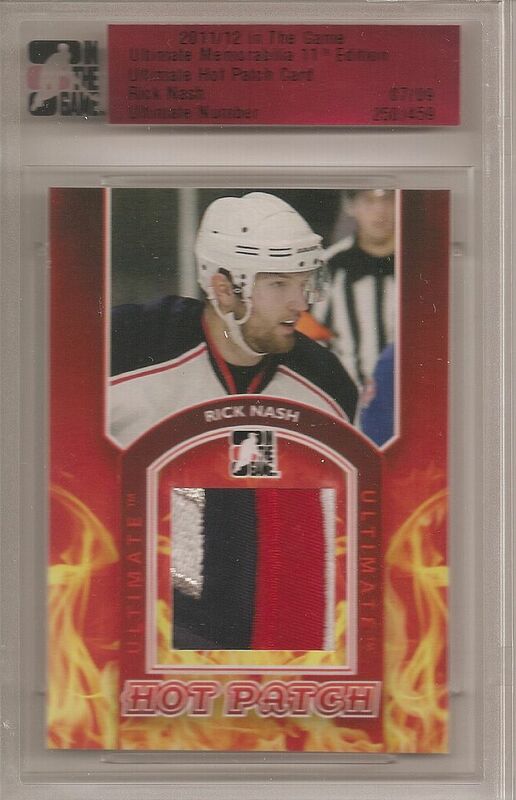 What I love about this card is that the back indicates that the jersey did indeed come from a game-used Chicago Blackhawks jersey that Mikita wore. It's such a bold statement to make in the current state of card production! So many other companies use event-worn pieces in their cards, but ITG boldly tells the collector that their pieces are from actual games. In terms of this card design, it's not the greatest, but it still looks good. It's lines are reminiscent of SPx without all the foil highlights. Now here's an interesting idea for a card - encapsulate a special moment in time. This card highlights Dave Andreychuk's 600th goal. He scored his 600th on November 23, 2002 on Corey Schwab. 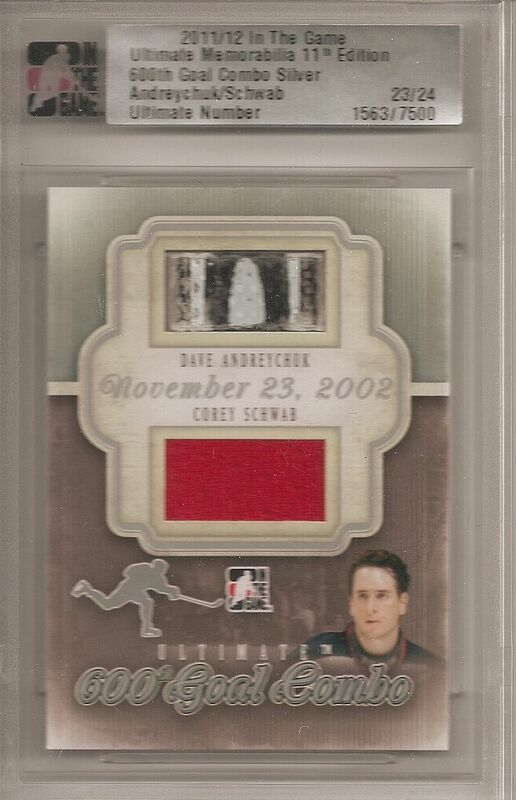 The card has a piece of Andreychuk's stick and a swatch of Schwab's jersey. I think this is a wonderful idea, but the execution of it could have been better in my opinion. I like the fact that there is a picture of Andreychuk, because I know in the past ITG would put out cards with no player image on the front. But I think it would have been even better to also include Schwab. Perhaps turn the card horizontally and make it seem like a dual between the two players - I don't know - just an idea. The best would be to have an image of the goal being scored. Unfortunately ITG does not have an NHL license so probably getting a photo of the actual 600th goal would have been out of the question. And that is really too bad. One pack in every 10-box case of UM11 will be a hot pack. These packs will contain some of the best patches from the product. I was fortunate enough to pull a hot pack in the one pack that I bought of UM11. Pretty lucky, but these cards look great and are limited to only 9 for modern players - 4 for vintage. I think including these hot packs as a special surprise for collectors was a great idea. ITG did a wonderful job of changing up the design to really represent what a hot patch should be like: RED HOT! Changing the label to indicate the heat was spot on. Over the entire production run of UM11 there were only 150 hot packs produced. There are many more amazing things to be found in UM11. The first that comes to mind are the 1 of 1 Ultimate Emblems cards. If you don't know what those are do yourself a favor and see if you can find some pictures of them on the internet. They will blow your mind. ITG's Ultimate Memorabilia 11th Edition is not a product for everyone simply for the fact that most people will not be able to afford a box. Even one pack of three cards is significantly higher than a standard box of hockey cards. But for those who want the best quality of memorabilia and the chance at some truly ridiculous game-used pieces... this is the product to get. The best way of experiencing UM11 is to get a box or to get boxes of it. Purchasing just one pack is a pretty risky gamble, but would suffice for just a taste of the product. For those who can afford it, UM11 is a product that delivers great thrills when being opened. It certainly ranks right up with the Cup and Dominion. 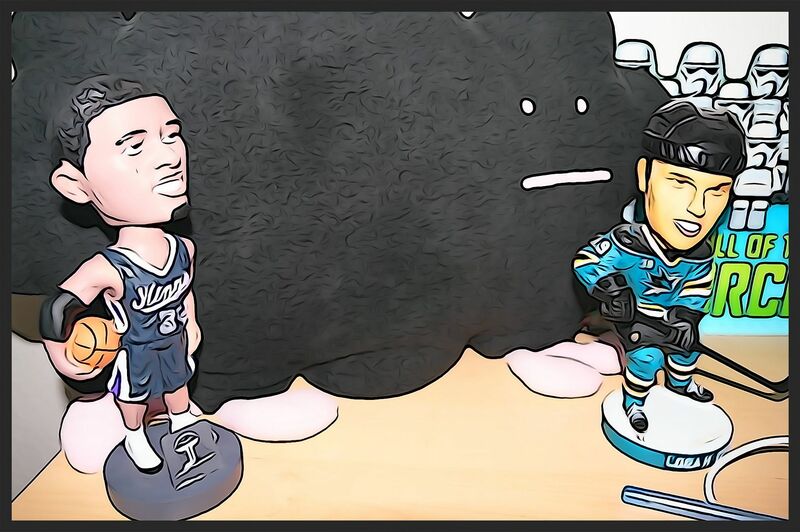 This year's Ultimate Memorabilia offering has improved in the design department, and I think this will attract more and more collectors to it. It's not all the way there yet, but it's so close! I'm really pleased to see ITG continue to step up their card design. 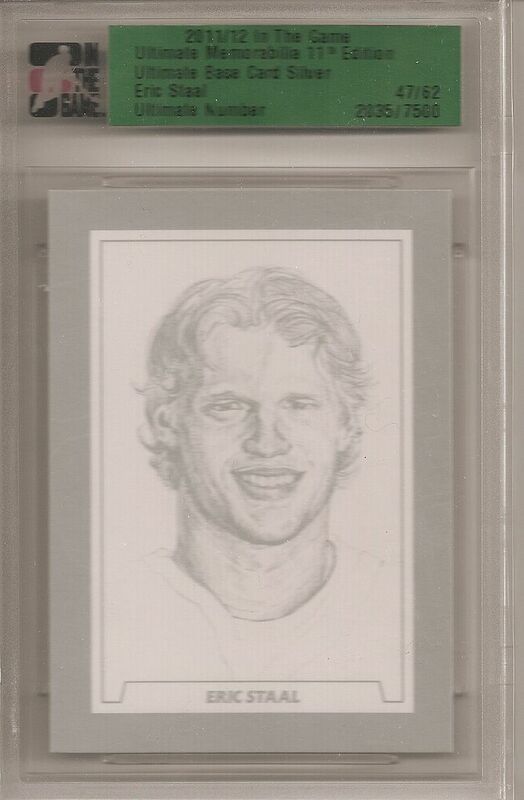 Particularly impressive was the Hasek autograph card shown above. More cards like this will definitely catch the eye of collectors who value not only the quality of the memorabilia, but also of the way the cards look. I pulled a hot pack! I personaly think that ITG 11th is a very nice product this year. it is very expensive but i think that it is worth it if you look at what you can pull. Wow, crazy hot pack. ITG put some really nice patches in here. Seems that a lot of the cards are low numbered so that's always a nice perk. Quite expensive but has some crazy cards in it! Thanks for the review! Great review! I think that ITG put some crazy cards in this product! I love the designs of almost everything (except the base cards). It is very expensive and I will probably never end up buying something like this, but if you have the money to purchase I think it is definatly worth it. Overall I give it a 9.5/10. I really like UM11. The hits you are guaranteed are always really nice and if you compared a box of UM to the CUP, i would chose the UM because i think it holds better value, and there are better and more cards to recieve in a box of UM. I love how the cards come in a graded packaging, they must hold better value because of those packages alone, making sure the cards are mint. I am not a huge fan of this product. I do not like the design of the cards but I think you get your moneys worth because they are all low numbered. Thanks for all the contests. i always liked the itg ultimate, too bad it is so expensive.. but i aleays try to get some card of my pc players. Really cool that the base cards are limited to 62, and the memorbilia cards are sick..
Great rewiew as alaways, and thanks for the contest.. I would love to get a box of ITG ultimate but like you said the price is just so high most people cant spend that much on a box of hockey cards, which is unfortunate. For the review though I definitely like what they did with the hot packs, like you said in your review adding that flaming border was a awesome idea! The base card design does like a little blah but every other card is just great! So overall, this is an amazing product but unfortunately I probably will not be getting any in the near future. UM11 Is awesome! Even though I definitely couldn't afford it. I think the base cards are really boring, the designs of the cards to me are ok, I would rather buy a nox of the cup, it seems to give you more bang for your bucksssssss. hey Luke, I think ultimate is a great product but I thing in the end the cup has much more potential in hits that ITG. Overall though I still think this product is very cool. I to do not like the base cards that much, but in my opinion the others cards have awesome designs. Like you said I couldn't afford it ( I can barely even afford a 11 12 artifacts) but it is still an awesome product. Itg ultimate is usually on of my favourite product every year.. i dont know why but for some reason this year im just not a huge fan. I would still probably go out and buy a pack to see if i could pull one of the huge hit that are out there. But i doubt i would be dropping 700 on a box. Great review and thanks for the contest. I like the idea of Ultimate but I'm not a huge fan of the price. To me it seems like to big of a gamble to make a good return off the cards you get. The hot pack you got was really cool but its still very high risk. Let's get real here. Those are the worst base cards ever made in the history of sports card collecting. the product is good but really expensive. hey luke, i feel that um 11/12 is very nice looking like always! i think that you will get your moneys worth if u buy a box or a pack. the only down side is that it is really expensive. but like i said you will get your moneys worth almost every time! I really do like this product, ITG has once again impressed me with the release of Ultimate 11th Edition, just too bad that I can't afford it haha. Each pack will have something cool and is definitely worth the price. 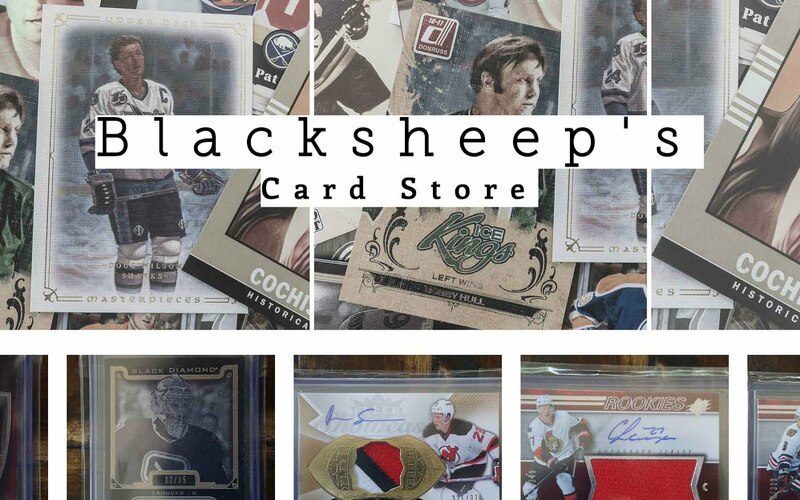 What I love about ITG is that they are able to obtain vintage memoribilia from hockey greats such as Maurice Richard, Bobby Orr, Bobby Hull and put them into products. It really would be awesome to pull a card with a piece of history. ITG isnt my favourite prduct because I dont really like the fact that they are all in the graded cases. But I do love the cards themselves, ITG is my favourite manufacturer of cards. This is a product that I would never be able to break at the price point. 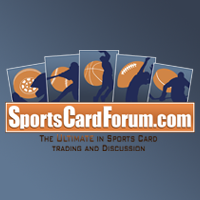 I think the mem cards in this product are very nice and ITG did a great job with the pieces. The base cards are average but for the price I don't think they should have included the base cards in each pack. I like how each card is casing though! I think this product is a bit pricey. For the price tag i would rather buy a tin of Upper Deck the Cup because i like being able to see and hold the card,but on the other side i do like the fact that they cant get damaged and will always be in mint condition. The base could use more color and more design. I also like how they have a big variety in memorabilia and autograph cards you can get. I give this a 7/10. Personally, I think this product is vastly overpriced. I feel their is most often much more value in a pack of Dominion or Cup. Also, I'd rather my cards came unslabbed, as I want to be able to touch and feel the cards, and the history behind them. Wow, some really great highend stuff in that product. You do great reviews, and I appreciate the constant contests. Amazing. ya your review was great as always .. i love this product but as i am a young collector the price is way to high!! This his a true high end card product. The inserts are crazy. Too bad I don't have the money to buy myself a box. Nice review, you are very interesting. Even for a french speaking man. CONTEST IS NOW OVER! But feel free to continue leaving comments about UM11!